1 Construction Regiment was established in 1957 as the Mobile Battalion, which in 1959 became the Mobile Watch. In 1964 it eventually became 1 Composite Construction Regiment and in 1967 the 1 Construction Regiment. It was disbanded in 1968, but re-established at the end of 1976 at Marievale near Springs. After 1977, it confined its activities to the operational area of South West Africa. 1 Military Printing Regiment was established in 1975 with a mandate to deliver mapping to soldiers and was responsible for the printing of the maps.1 Military Printing Regiment was relocated from Koedoespoort in 1994.It was finally amalgamated with 47 Survey Squadron after 1994 to form the Engineer Terrain Intelligence Regiment which formed part of the SA Army Engineer Formation of the South African National Defence Force (SANDF). The new unit is based in Pretoria, Gauteng, and is responsible for providing the cartography needs of the South African Army. 2 Field Engineer Regiment was formed in 1946 and disbanded in 1958 until, in 1962, the Regular Force was formed with 17 Field Sqn to support this force in Potchefstroom. Moved to Bethlehem in 1967 to become a training unit, it became the new 2 Field Engineer Regt in 1974, comprising 21, 22 and 23 Field Sqns as training sqns, and 24 and 25 Field Sqns as support sqns in the operational area of South West Africa. 4 Survey and Printing Regiment was formed on 1 January 1967, as a unit for both the Permanent Force and Citizen Force. It was reformed by amalgamation in 1983 of the 3 Survey Squadrons which existed at that time, 46 Survey Squadron, formed at Cape Town in 1959, 45 Survey Squadron, formed at Pietermaritzburg in 1969, and 47 Survey Squadron, a PF unit formed in 1975. This Unit trained all the National Servicemen posted to it and in turn fed the two CF Survey Units which had been established. By 1992, 4 Survey and Mapping Regiment comprised of the Geographical Information Squadron, the Terrain Negotiability Squadron (degraded to a Troop status in 1994), the Mapping Squadron, as well as 45 Survey Squadron, 46 Survey Squadron and 47 Survey Squadron. Another unofficial squadron, 49 Survey Squadron, was seemingly unofficially established in 1995, but it just comprised of the reserve force component of 47 Survey Squadron. 6 Field Engineer Regiment [Afr: 6 Veldgenieregiment] was originally established as 6 Field Engineer Squadron [Afr: 6 Veldgenie-eskadron], a Citizen Force unit based in Kroonstad as part of the Orange Free State Command. It was upgraded to a regiment before finally being closed down. No establishment dates are available. 12 Field Engineer Regiment (also known as 12 Engineer Regiment) [Afr: 12 Veldgenieregiment] was originally established as an Active Citizen Force unit in 1939 and saw service in East Africa, Syria and Egypt during the Second World War. It remained a unit of the ACF after the war until its disbandment in 1959. The present unit was established as a Citizen Force unit, 12 Field Squadron SAEC [Afr: 12 Veldgenie-eskadron] on 22 August 1961. The unit became a founding member of 72 Motorised Brigade in August 1974, and has seen active service on the SWA border, first in 1976, and then again in 1979. During Exercise Kwiksilver in 1978, the unit earned the distinction of having built the longest Bailey Bridge in South Africa since the Second World War. By 1988 it had been upgraded to a regiment and from 1 November 1991 it was placed under command of the Army Battle School to provide engineer support to the new formation, and from 1992, also the Rapid Deployment Force. 13 Field Engineer Squadron formed part of 82 Mechanised Brigade and played a major role in the lifting- and laying- of minefields during Operation Packer at Cuito Cuanavale in Angola in March/April 1988. 17 Field Squadron [Afr: 17 Genieveldeskadron] was established as a military engineer unit at Potchefstroom, in January 1962, to help with the training of hundreds of National Servicemen every year. In 1963 the unit help build the firing range at Walvis Bay; in 1965 it asssisted with the construction of a test firing tunnel at Potchefstroom; in 1966 it built hangars at the military bases in Potchefstroom and Bloemfontein; in 1967 it constructed another firing tunnel at Pretoria, as well as a concrete bridge across the Olifants River, at Middelburg in the Tranvaal. The unit was relocated to Bethlehem in November 1967 and received the freedom of the city of Bethlehem on 31 Oct 1970. During 1970, the unit constructed a large concrete bridge of 196m over the Pongola River, a 327m long train-bridge across the Orange River at Bethulie; an emergency Bailey-bridge over the flooded Nahoon River-bridge, near East-London. In 1973 17 Field Engineer Squadron became the new 2 Field Engineer Regiment, located at Bethlehem. 21 Field Squadron formed part of 2 Field Engineer Regiment and was located near the dam just outside Bethlehem. 22 Field Squadron formed part of 2 Field Engineer Regiment and was located in the mountains outside Bethlehem. 23 Field Squadron formed part of 2 Field Engineer Regiment and was located inside the town of Bethlehem itself. Engineers with medical conditions were posted here. 35 Engineer Support Regiment [Afr: 35 Geniesteun-regiment] was originally established at Kroonstad as 35 Field Park Squadron [Afr: 35 Veldparkeskadron] and in 1974 became 35 Engineer Support Unit [Afr: 35 Geniesteun-eenheid]. It was later moved to Marievale near Springs where it was renamed to 35 Engineer Support Regiment [Afr: 35 Geniesteun-regiment] and the '35' on the flash was replaced by the bee. After a decision to separate the SAEC's surveys and mapping responsibilities from the Quartermaster General's printing function, 47 Survey Squadron under Major F.H. du Preez, was formed on 1 April 1975. The need for military survey and mapping of the SA Army at that time was to be satisfied by this Squadron. According to Orpen & Martin a Permanent Force nucleus was thus provided for a vital Sapper task which could become even more essential if the continuing "low intensity" conflict along the border should ever worsen. 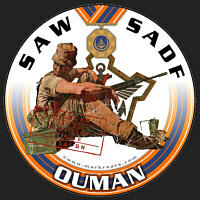 In 1992 the SADF commenced restructuring and the two citizen force squadrons, 45 and 46 Survey Squadrons were brought under command of 47 Survey Squadron, only to be amalgamated on 2 June 1992 into 4 Survey and Mapping Regiment. The Directorate of Engineers was established at Kroonstad in 1969, but in 1972 it was moved to SA Army Headquarters, Pretoria where it was developed further. In 1982, the SA Army Engineer Formation was created with the Directorate of Engineers as its Headquarters and commanded by the Director of Engineers which gave the Directorate operational control over most of its Engineer Units. The School of Engineers started in 1946 when an Engineer Training Wing was established at what was then the Military College, now the Army College. In 1948 the Wing was moved to Potch-efstroom, where it became the Engineer Wing of the Artillery and Armour School. In 1968 it was transferred to Kroonstad as the Engineer Training Centre and finally in 1969 became the School of Engineers. The Witwatersrand Command Engineer Regiment [Afr: Kommandement Witwatersrand Genireregiment] was established in Johannesburg during September 1991, with the amalgamation of 5 Engineer Squadron and 18 Field Engineer Regiment. 5 Engineer Squadron was a continuation of the original "5th Field Company" which had played such a major role in the successes of the South African Engineers during World War 2. With the advent of Operation Savannah in 1976, it was decided to reinforce the Territorial Commands with their own engineering capabilities, and 5 Engineer Squadron was activated to fulfill this role within the Witwatersrand Command. 18 Field Engineer Regiment, on the other hand, was a conventional regiment that had formed part of 73 Motorised Brigade up to its amalgamation with 5 Engineer Squadron. The Witwatersrand Command Engineer Regiment has a rich history because of its mother-units, and strives to become the best engineer regiment in South Africa.